Sherlock Holmes -- "Adventure of the Serpent God"
Sherlock Holmes aired "The Adventure of the Serpent God" on March 14, 1948. Out of the nearly 300 OTR episodes we've run since June of 2009, this is only the seventh featuring Sherlock Holmes, so we felt it was high time for another grand adventure spotlighting the world's most famous detective. As always, Dr. Watson relates the tale to the show's host, and this one, in Watson's words, deals with how in the early 1900s he and Holmes thwarted a "bloodthirsty Hindu uprising." One of Holmes and Watson's more exotic adventures, this caper has to do with a serpent god cult begun in a mountainous region of northern India, a maharajah and young prince, a hidden temple in the midst of grey, foggy London replete with evil idols and dark ceremonies -- and none other than Holmes' dedicated and dastardly foe Dr. Moriarty! 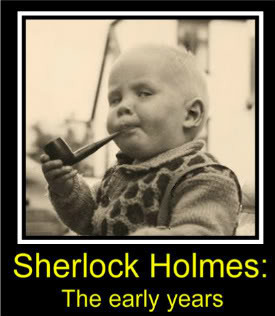 This story was penned by none other than Edith Meisner, who was such a champion and lover of the Holmes and Watson adventures that it was from her singular efforts that the adventures of the world's greatest detective were brought to the airwaves in 1930, where it would enjoy a lengthy run until 1956 (with a half-hearted and short-lived revival comprised of reruns in 1959). Meisner would first adapt radio episodes from the original stories and then write new ones all by herself for several years, then would turn the reins over to other writers, one of whom was Anthony Boucher, future co-founder and editor of The Magazine of Fantasy & Science Fiction. "The Adventure of the Serpent God" is a fast-paced tale where (as Watson puts it) the fate of England may be at stake due to a murderous cult under the hypnotizing influence of Dr. Moriarty. So what's not to like?